The Stone Age meets modern-day L. A. in this timeslip fantasy. The plot features Neanderthal man, tribal conflict, fast cars, drug trials and a demon, and the weirdness doesn't end there. The story begins with Ria, a girl of 16 who decides to take action when some of the young men in her Clan set upon a lame boy. He's one of the people known to her tribe as the Uglies. Ria's selfless rescue lands her in hot water, but it also earns her the friendship of Brindle, the boy she saved. In another time, Leoni is getting in trouble with the police. After a dressing-down from her adoptive parents she takes an overdose, leading to a near-death experience and the threat of a long incarceration in a mental hospital. The trouble is, she doesn't feel like she's being held there for her own safety, or that she will even get out alive, because her family aren't the loving, concerned people they appear to be to the outside world. Do they have sinister plans for her? Leoni isn't very likeable at this point. She's reckless, feckless and spoilt, and it's as though she's using her childhood trauma as an excuse for misbehaviour. What's more, she suspects that the trauma was all in her imagination. 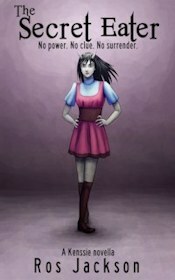 However things change when she meets a mysterious blue angel and learns about the nefarious plans of a demon named Sulpa. She has to journey into the spirit world to stop him, even though people in the normal world are out to destroy her, and the spirit world holds its own dangers to body and soul. Entangled gets off to a violent, action-packed start, spiced up further by some very odd events. The spirit world is alien and threatening, and this often spills out into the 21st century or the Stone Age. Sometimes this strange, high-octane mayhem works well. However it soon becomes formulaic and overblown, particularly when every chapter ends on a cliff- It's hardly understated. The Illimani are trying to hunt down and exterminate as many Uglies as they can, before moving on to destroy other Stone Age tribes. Ria finds herself involved in a war which she looks like being on the losing side of. There's blood and death, and then some. Hancock's descriptive style focuses on extremes, so that he's often talking about the biggest, shiniest, gloopiest, nastiest or the most of whatever he's discussing. A tendency to use more words than necessary and to repeat ideas makes for tedious reading after a while. This quote from chapter 52 is typical of the style: ".. it wasn't the muddy waters of the Amazon they'd entered but some gloppy, transparent, mucilaginous goo,"
"like a torrent of thick snot." On top of this repetitive language there are passages of exposition in which expert characters hold forth on topics such as near-death experiences, travelling in the spirit world, and drinking Ayahuasca to induce visions. Once is forgiveable, but this type of scene happens several times, and it grates. The novel may be well researched, but there are better ways to sneak in these details without resorting to the old character-listens-to-a-lecture routine. Quite a few of the minor characters are no more than caricatures, such as a pair of mean and beefy nurses Leoni meets in the mental institution. As the plot progresses situations get increasingly fanciful. There's heavy violence, lots of drug taking, and the occasional really disgusting scene. It all adds up to a pacey yet unsubtle novel which will have the most appeal for anyone who prefers fast, accessible writing to a narrative with more depth. Fans of Dan Brown might like this. No similar books or films have been suggested. I was really looking forward to reading Entangled. I ordered the book long before it came out in Canada. I love the concept of the cro-magnon girl and the modern day girl being 'entangled'. 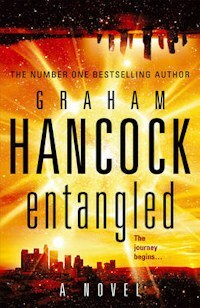 I enjoyed the first several chapters, Graham Hancock is an excellent writer and I've read many of his books. However, after those first several chapters the book became one huge gore-fest. When I read about the book I didn't think that there would be this much violence. I do not like violence of any sort, I do not watch violent movies or read violent books so I found myself skimming over lots of the violent sections. I'm disappointed that Graham had to resort to such graphic brutal violence. Entangled could have been a really great book if all the pointless the violence was redacted out. Also the story does not finish, it continues in another book yet to be written. I will not be buying the next book unless by some miracle it is written minus the violence. Thanks for that comment Marlyn. I notice increasing violence seems to be a trend in contemporary writing. A lot of things that might have been toned down a few years back are now getting published, as though we're losing our sensitivity to extremes of blood and gore. This is something you can also see with film ratings, which tend to lose their meaning over time as a new generation of raters have adopted a more relaxed attitude to what they'll pass for the various age groups. What a lot of drivel. I felt as if I were reading the plot for a video nasty or a violent game. At the end of the book I thought I had read a damaged coppy as it suddenly stopped dead with no explanation, what a farce! I read this book understanding that he wrote it with the guidance of entities contacted through shamanic practicies. If so what is it they want us to know. I see parallels in this world with the deliberate destruction of innocence which feeds an evil agenda (in all parts of the world from isis to overt sexualisation of children in the west) but what is the antidote Graham? Will that come in the second book? I agree the endless and graphic violence sees to be bordering on a celebration of evil. I look forward to the second book to see how it is all resolved, if at all. Hi Concerned, sorry about the delay in approving this post and replying, and thanks for offering your thoughts. It is a concern that there's so much violence in the world, and that is echoed in this book. The aim of real-world and literary violence is often the same: to shock. The good news is, studies have shown that readers often have more empathy, so I think the problem of violence in literature is more a question of taste than morality.